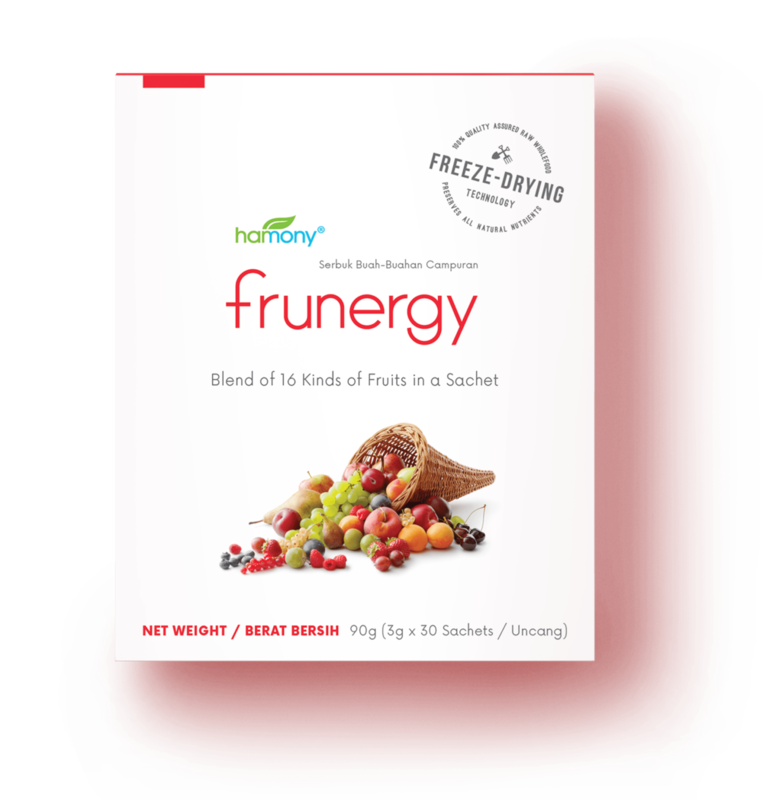 Frunergy is carefully formulated to deliver all the benefits of fruits as found in Nature. Each sachet of Frunergy provides more than 100% RDA of naturally occurring, biologically active Vitamin C.
That is because we packed 16 different types of fruits in Frunergy! yep, you heard us. 16 different types of fruits. Like the most ingredient-packed juice you’ve ever ordered, the list of ingredients in Harmony® Frunergy packs a punch. It is made from 16 kinds of real, sustainably grown fruits. Each of the fruits is specifically chosen to provide you more than 100% RDA of Vitamin C per sachet - 152% RDA in precise. Completely free of artificial colours, flavours, sweeteners, preservatives or any other additives. 16 kinds of sustainable fruits. What makes Frunergy natural, different from others? The fruits we sourced are fully imported, high quality farm-grown produce. Freeze-dried immediately after being freshly harvested, we assure you that all enzymes, vitamins, minerals, flavours and other natural composition are carefully preserved and sealed within. It is one of the most advanced technology! Nothing beats getting Vitamin C directly from real food. Unlike synthetic pills, natural Vitamin C complex comes accompanied with a synergistic network of phytochemicals, flavonoids, enzymes and other co-factors, ready to be effectively utilised by your body. You have no time for fruits? No problem, Frunergy is here to deliver all the nutrients and benefits of fruits as found in nature. Add 3 sachets or 9g into a glass of 200ml of water or juice, stir well and enjoy. Or consume directly by pouring the content directly into your mouth to taste the power of 16 types of fruits altogether! Just a small heads up, our Frunergy is a little sour in taste due to the one of the fruit acelora, which is super high in Vitamin C! 30 individual sachets per box. 3000 milligrams of goodness per sachet. Each box houses 90 grams of Frunergy powder. make sure you get enough greens too!